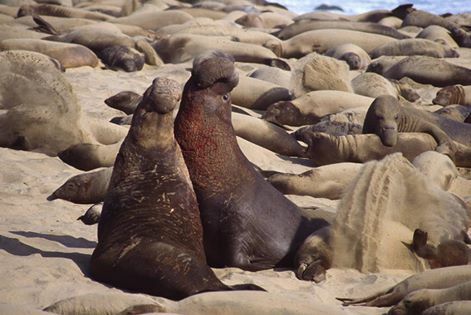 Up and down the west coast of the US and Mexico, thousands of Elephant Seals are gathering for the biggest event of the year– breeding season. Most of the year these colossal seals spend their time at sea, hunting prey like squid and rays, and building up fat reserves. During the spring and summer, a few of them make appearances on the beaches to molt, a process that can take up to a month as they shed their old layer of skin, fur and whiskers. (Sounds itchy.) But now, during the winter they return to the shore for a miraculous whirlwind of birth, mating, and competition. 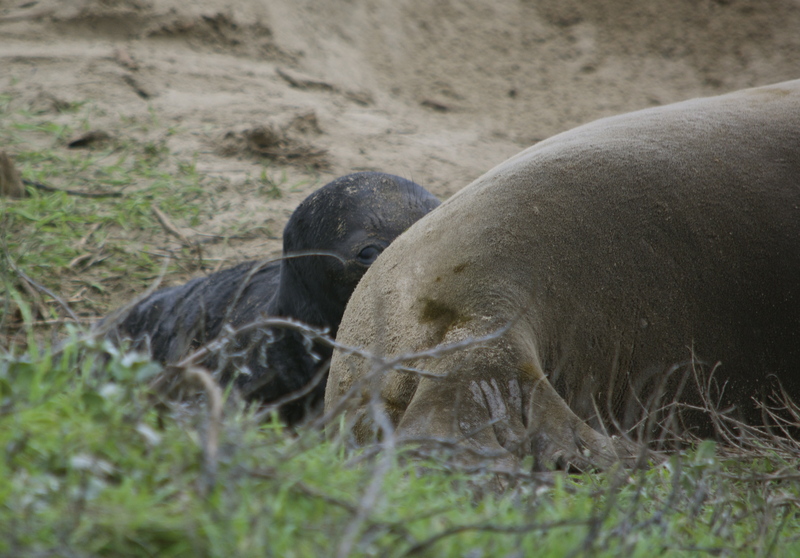 Males at Año Nuevo. Photo credit: Thomas Finn. The first seals to show up are the enormous 14-16 feet long, 5,000 pound males, who begin sizing each other up and eventually engaging in intense battles to establish breeding rights. Like blubbery knights, these giants wear a “chest shield” of thick skin to protect them from enemy teeth during bouts. Their elephantine noses help them produce loud roars during competition, and also retain moisture during breathing, as they won’t leave the beach for food all season. So what’s the prize? 40-50 lady friends. As females begin to trickle in, they form groups called “harems”. 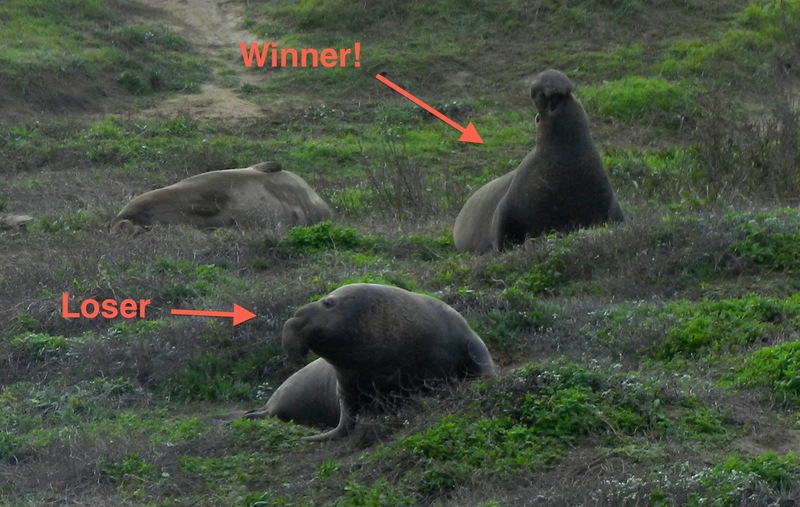 The winning male will breed with all the females in a harem. Competition is fierce over these 1000-pound females and bulls often end up bloodied and scarred, but they rarely fight to the death. Day old baby nursing. Photo Credit: Thomas Finn. But females are not ready to breed when they first arrive. In fact, most of them are still pregnant! 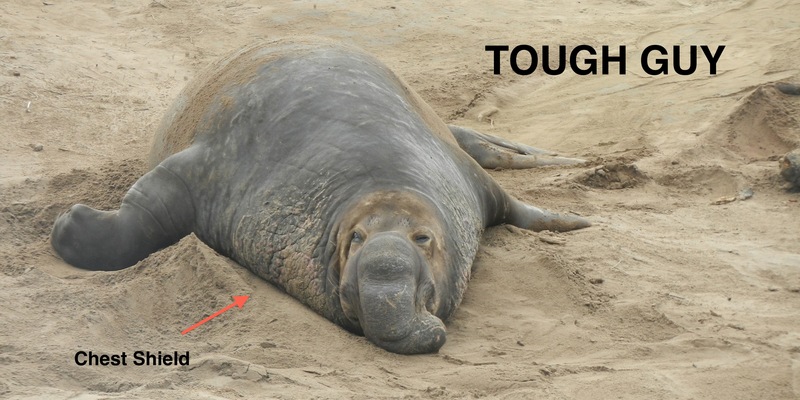 When they first reach the beach, they give birth to pups about the size of a 10-year-old boy (75 lbs). After about a month of feeding on mom’s 55% fat milk, the baby will weigh in at about 300 pounds (gaining an average of almost 8 pounds a day!). Only then will the mom go into estrous and be ready to mate again. Occasionally you will see an especially chubby pup sneaking milk from multiple mommies. These “super weaners” can grow to double the weight of their smaller peers, but the super weaners will soon be in trouble when their fat makes it hard for them to dive deep to find food. After mating a few times, females return to the ocean. By mid-march only pups will be left on the beach, learning to swim in the shallows and eventually heading off into the ocean until next season. Stay tuned to the events of this season by visiting the Año Nuevo State Park facebook page or check out the California coast! Año Nuevo State Park offers guided tours, but you must always stay at least 25 feet away from seals – although they look slow, they can move up to 8mph in short bursts, and can be dangerous!